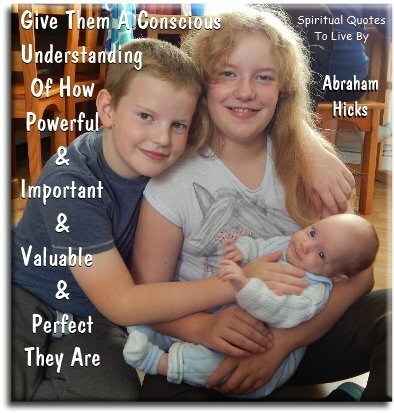 Abraham-Hicks teachings are unquestionably the ultimate guidance on life. 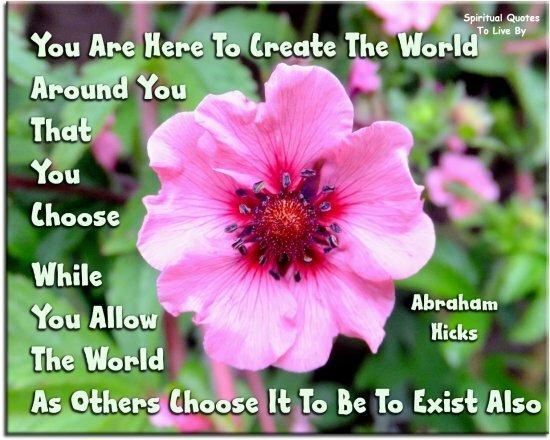 Esther and Jerry Hicks have been teaching the Law of Attraction since the 1980's. Through books, CD's, DVD's, workshops and the internet they circulate the wisdom that Esther brings through from Abraham (a Collective Consciousness). 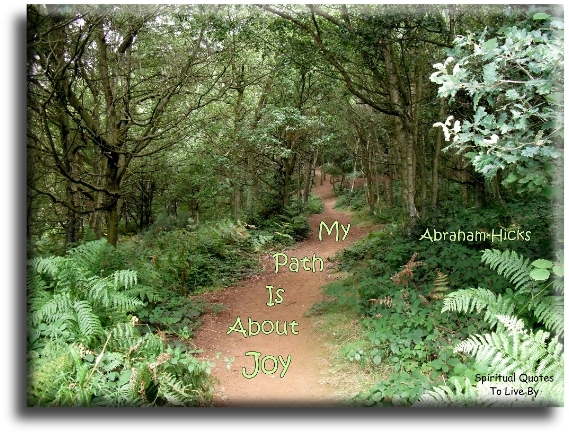 My understanding of the Law of Attraction has been mainly through Abraham materials. I first read "Ask And It Is Given" in 2006, and although I didn't really 'get it' at that time, I KNEW that this was an extremely important book to me. Since 2010 I have studied and absorbed the teachings of Abraham into my everyday life and I now believe that I understand the principles of their guidance. I love to watch or just listen to Abraham speaking through Esther; the love, warmth, wisdom and humour just radiates out to the world. But this wonderful knowledge that we can all now share would not have come about if it wasn't for Jerry and his questioning nature. We are truly blessed with having Jerry and Esther devote so much of the lives to sharing Abraham with us all. Jerry Hicks made a transition into the Flow of Eternal Life on 18th November 2011. 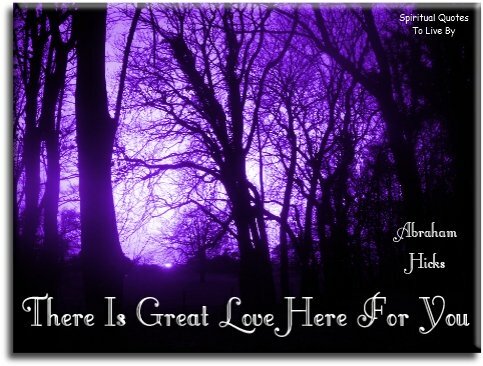 Although his physical presence is missed it wasn't long before his Non-Physical Energy was coming through to Esther and continues to be a part of the work that they so lovingly provide for us all. 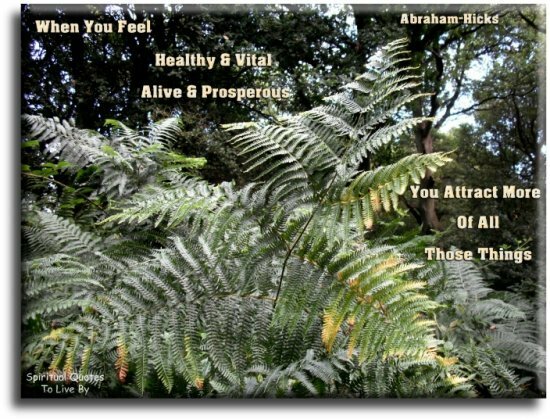 Abraham teaches that there is no such thing as Death, we are, and will always be, Source Energy... it's just sometimes partly focused in a physical body. 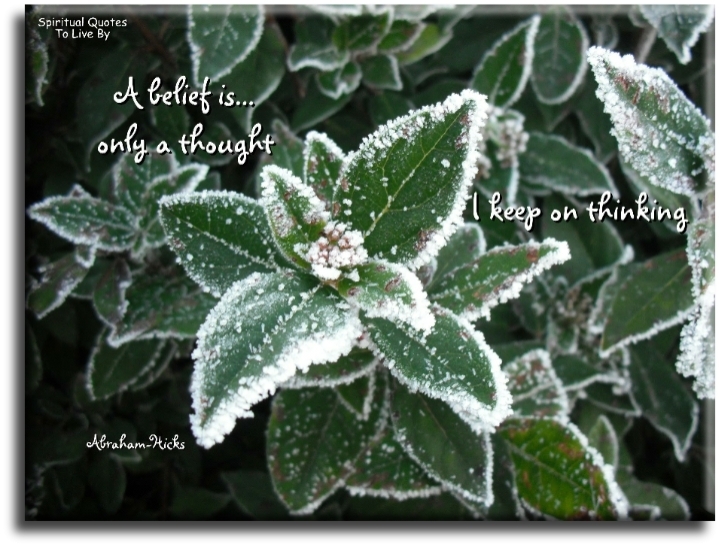 Some of the quotes have a link under them to my page of Abraham-Hicks quote poems, these are poems written by myself that use a quote from Abraham as the title and theme. Diseases follow thought lines, not blood lines. Even the most dreaded disease will vanish when you completely remove your attention from it. Expectation is the most powerful condition that you can accomplish, because an expectation is a holding of a desire, a clear desire, and a belief about the same thing at the same time. 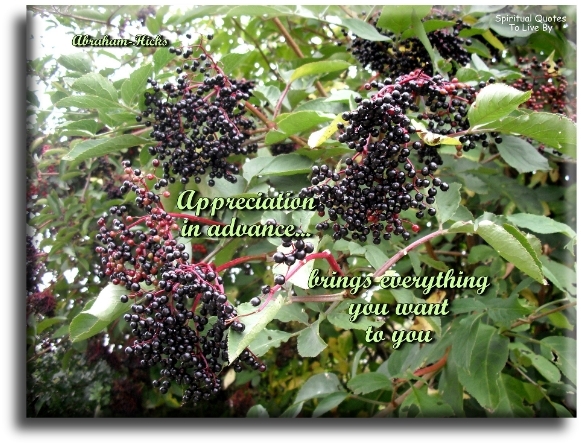 Feel Appreciation for what is… and Eagerness for what is coming. Give them a conscious understanding of how powerful and important and valuable and perfect they are. If there is something that you desire and it is not coming to you, it always means the same thing. You are not a vibrational match to your own desire. 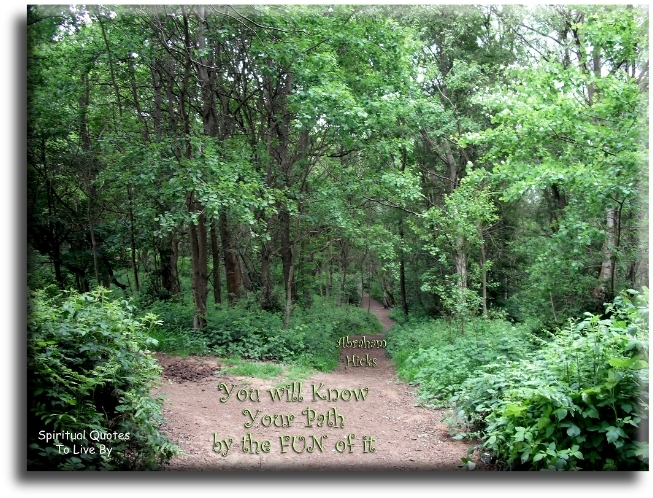 If you’re not excited about it, it’s not the right path. 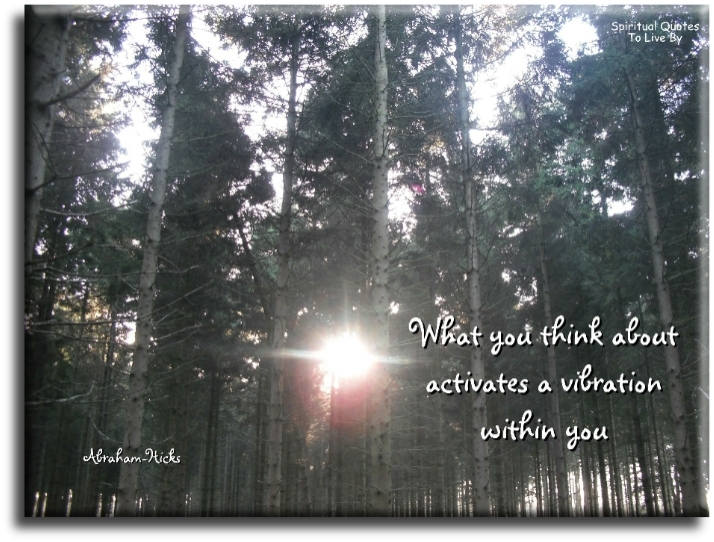 If you’re not thinking about a negative thought, you’re vibration is going to raise to its natural place. In this powerful now, wherever you are looking is transformed from the vibration from which you look. That’s why you live in a world that is the same for everyone, but it is not - everyone that is walking down the same street is having their own unique experience. Non-physical consciousness is here with you all the time. People may love you and people may hate you and none of it is anything to do with YOU. See yourself as a magnet getting more and more of the way you feel. 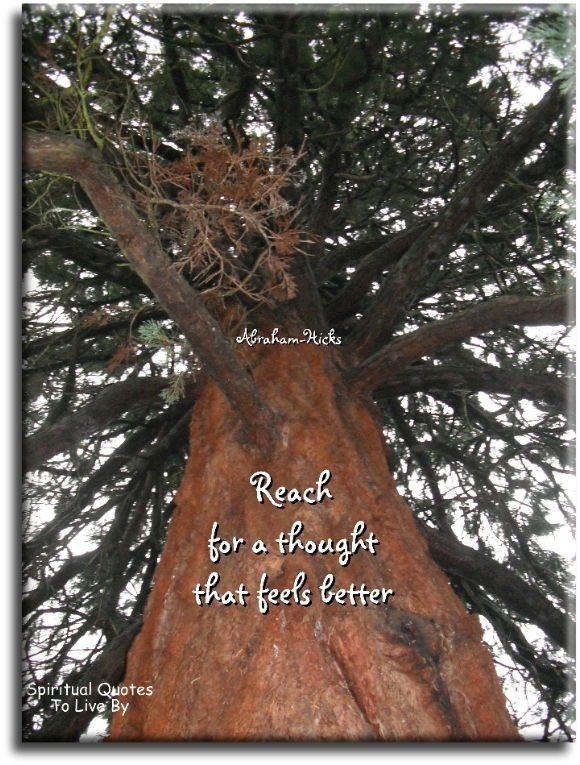 The better you feel… the more you allow. 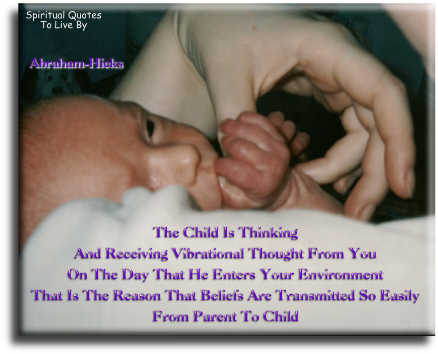 The child is thinking and receiving vibrational thought from you on the day that he enters your environment. 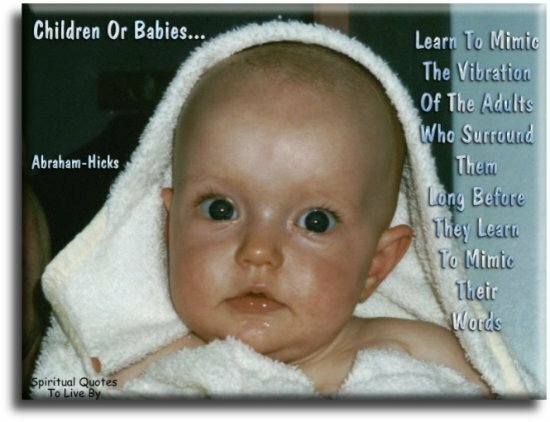 That is the reason that beliefs are transmitted so easily from parent to child. The easiest way to let it in is by talking about what you want and why you want it. The Law of Attraction is most understood when you see yourself as a magnet getting more and more of the way you FEEL. The process of breathing is much more than an essential function of your physical body. Indeed, it is the flowing of Spirit to you, and through you. 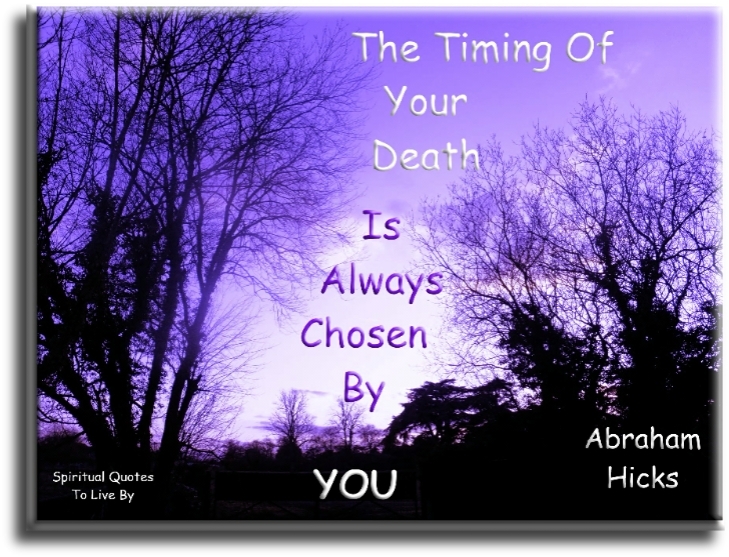 The timing of your death is always chosen by you. The Universe does not know if the vibration you are offering is because of what you are imagining, or because of what you are observing. Understand that there is nothing outside of you that is making the difference. We want you to feel the appreciation of that which you call God, and that which we call All-That-Is, for the expansion of the Universe, that is a result of the Beingness that is you. What someone thinks of you cannot affect you. It is your focus about what you imagine they are thinking that affects you. When you become so determined that you want to feel good, you have become as your Inner Being is, in such a pure place of Positive Energy, then that which is negative energy simply can’t mix with you. It defies law. 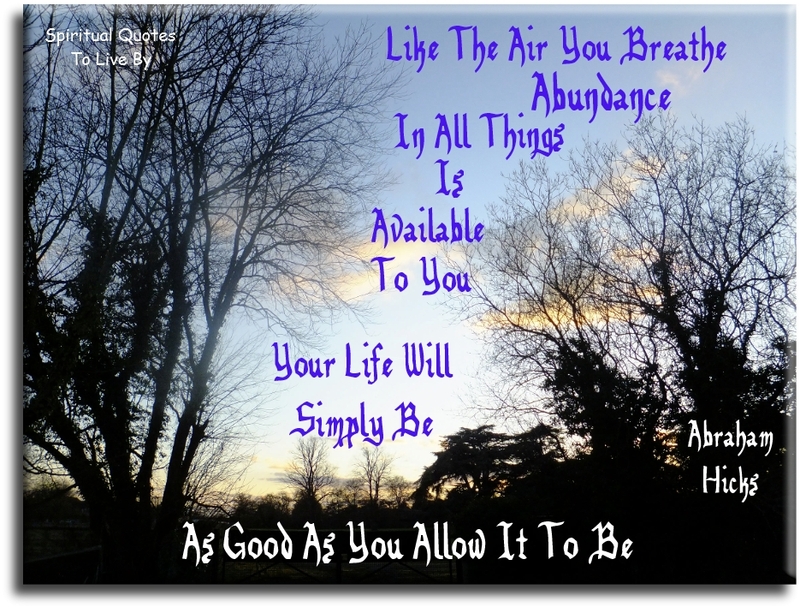 When you FEEL healthy and vital and alive and prosperous.. You attract more of those things. You are the owner of all that you perceive, but you can’t perceive apart from your vibration. Feel your way, little-by-little, into a greater sense of abundance, by looking for the treasures that the Universe is offering you on a day-to-day basis. You can only coax someone into the Vortex from in the Vortex. You didn’t come for the manifestation… you came for the manifesting. You didn’t come for the creation… you came for the creating. 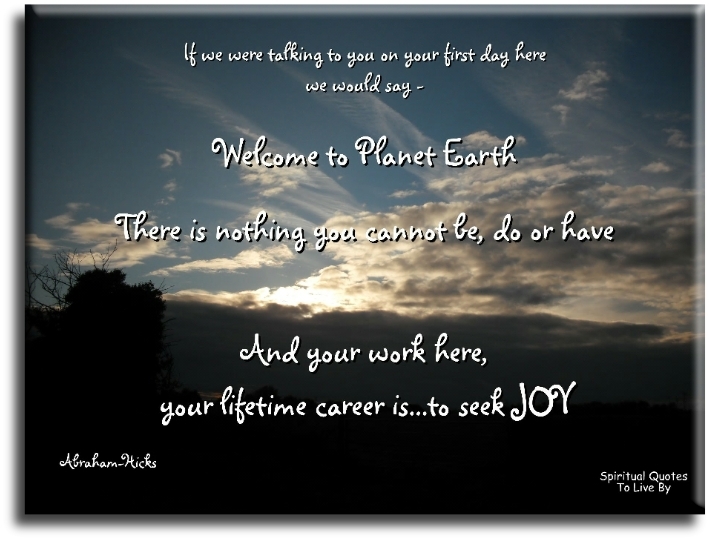 You came because you are a Creator and a Creator’s gotta create. You don’t have to pull strings to get what you want. All you need do is walk in the consciousness of already having it. You get what you expect, have you noticed that? You expect to survive, and so you do. You expect to have a roof over your heat, and so you do. You expect to live alright, and so you do. But you don’t expect extraordinary things, so they don’t come. You don’t expect magnificent money to flow into your experience, and so it cannot get in. 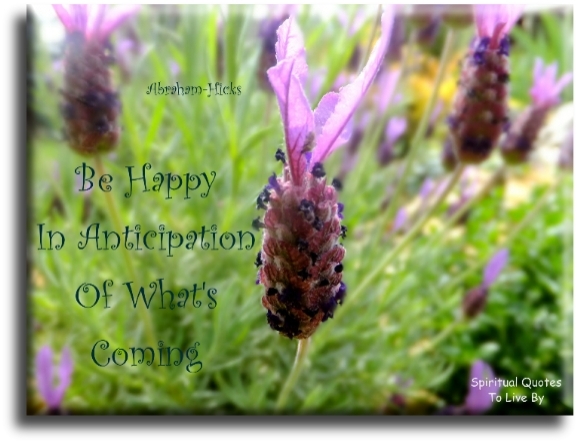 The only thing that comes to you is what you are expecting to come to you. Your most powerful moment is NOW. 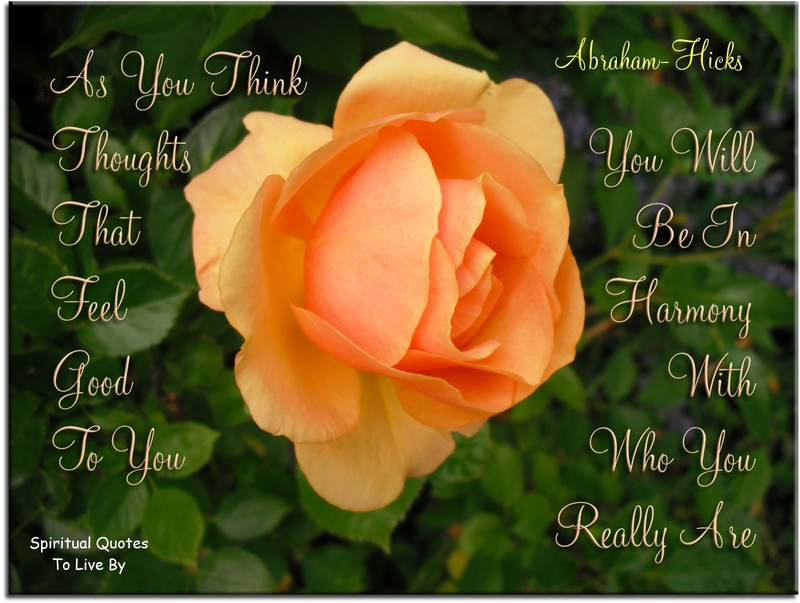 Your thoughts change the behaviour of everyone and everything who has anything to do with you. 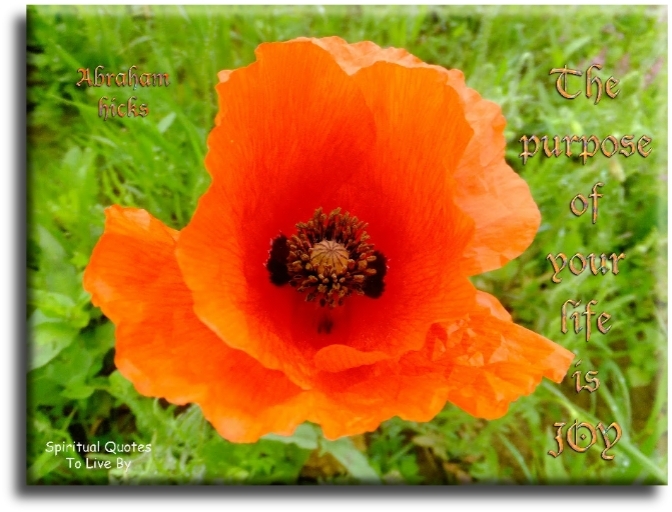 Your work is to bask in the pleasure of your eternal unfolding. 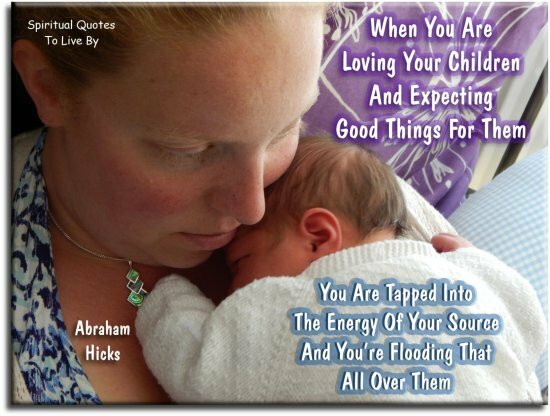 You’ve got to think thoughts that uplift you before you have anything to give your children.